MWI is always writing and contributing to the marketing industry. See some of the articles we've written on marketing, as well as placements we've secured for our partners. Digital marketing is always changing, and we want to be at the forefront of those conversations. We do our very best to contribute insights and articles to the marketing industry. Over the past several years we’ve written 300+ articles for publications like Forbes, Entrepreneur, TechCrunch, Time, Inc., and others. Our team is focused on the future of marketing and the trends that will impact our partners’ businesses. Check out some of our articles that we’ve written and let us know if you have questions we can answer. If you’re interested in hearing about marketing trends from CMOs of leading brands, then check out this book written by Josh Steimle, founder of MWI. 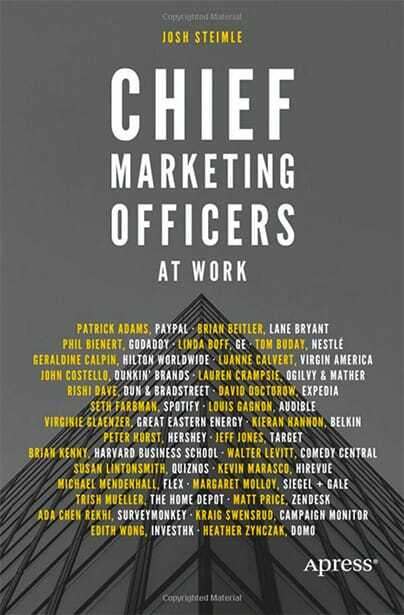 Chief Marketing Officers at Work contains 29 exclusive, in-depth interviews with chief marketing officers like Jeff Jones of Target, Linda Boff of GE, Brian Kenny of the Harvard Business School, Trish Mueller of The Home Depot, and Seth Farbman of Spotify. This book will help C-level executives and others who interface and collaborate with marketing departments to understand how marketing drives growth at both startup and enterprise levels, and how marketing has moved from art to science. As a part of our content marketing services, we secure PR opportunities for our partners. Below are a few articles we've placed. China Tycoon Reinforces Message By Singing - Could You Do This, Too? What are some of the best hacks to building a hugely successful crowdfunding campaign? Bryce Fisher has a lot of them up his sleeve.